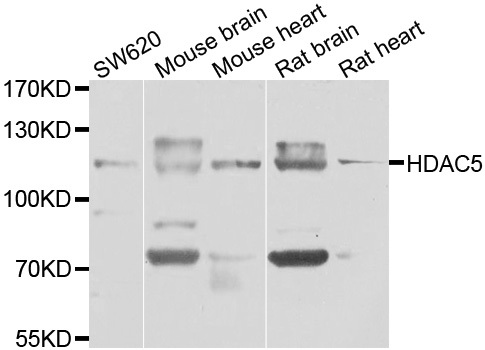 Western blot analysis of extracts of various cell lines, using HDAC5 Polyclonal Antibody. 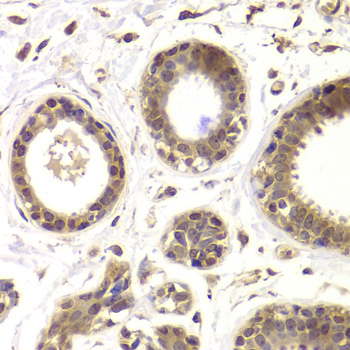 Immunohistochemistry of paraffin-embedded Human mammary gland using HDAC5 Polyclonal Antibody at dilution of 1:100 (x40 lens). 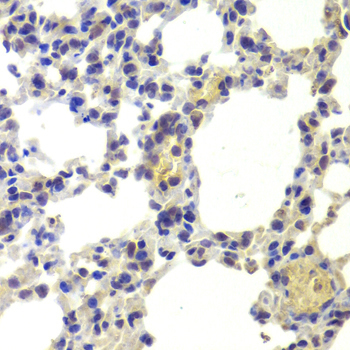 Immunohistochemistry of paraffin-embedded Mouse lung using HDAC5 Polyclonal Antibody at dilution of 1:100 (x40 lens). Histone deacetylases (HDACs) play a critical role in transcriptional repression of geneexpression in eukaryotic cells through catalyzing the hydrolytic removal of acetylgroups from histone lysine residues. Three distinct families of HDACs have beendescribed, comprising a group of at least 20 proteins in humans. 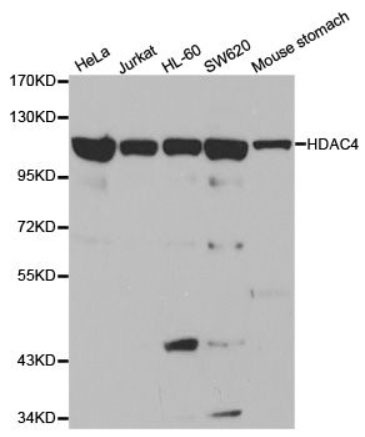 HDAC5 is a class II histone deacetylase. 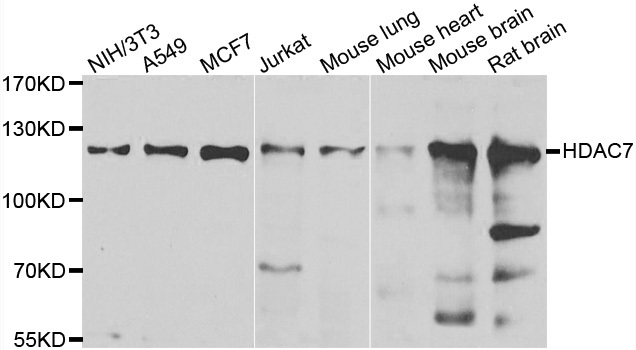 HDAC5 Polyclonal Antibody. Unconjugated. Raised in: Rabbit. Marumo T et. al. (July 2008). Epigenetic regulation of BMP7 in the regenerative response to ischemia. J Am Soc Nephrol. 19(7):1311-20.